UNITED NATIONS, May 12, updated -- The 2009 elections for the UN Human Rights Council, while drawing last minute outrage from a range of non-governmental organizations, seems largely a foregone conclusion. Most regional groups, including the oft self satisfied WEOG, Western European and Other Group, presented consensus slates with the same number of candidates as seats. New Zealand backed down for the U.S., perhaps in exchange for the U.S. dropping its candidates in the face of new UN Development Program Administrator Helen Clark. Freedom House, a now hybrid group, sponsored a session with Saudi and Cuba dissidents in the office of Bahai. Afterwards, Inner City Press asked why Freedom House, unlike co-sponsor UN Watch, had joined a wider, mostly liberal coalition. It is good to work together was the answer. But the liberal coalition complained last time that despite their endorsement of Zambia, Freedom House broke ranks. UN Watch, speaking truth to power, noted that some groups it left unnamed have a revolving door with the UN system. They were diplomatic, not wanting to attack their Geneva colleagues. But it is not rocket science: Human Rights Watch in Geneva has a director from the UN. The door spins the other way, too: to be appointed a special rapporteur now requires the support of member states, “the Pakistan's of the world,” as one NGO put it. Those seeking careers in human rights are holding their tongues. Careerism is a killer, in this field as others. 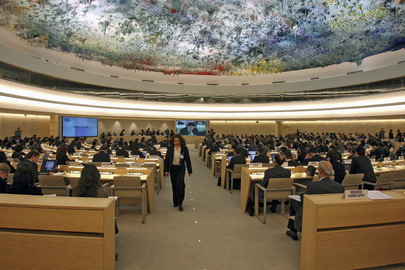 HRC ceiling in Geneva, development aid funds used? The slates, for election on May 12, include only 20 countries running for 18 seats. The only contested regions are Africa (six candidates for five seats; only Nigeria did not submit a voluntary pledge, according to the GA; Mauritius or more likely Djibouti may end up with the short end of the stick) and Eastern Europe (three for two, with Azeris on the cusp). Only two will lose out -- if they don't drop out in advance in the secret balloting. Freedom House has denounced Azerbaijan, Cameroon, China, Cuba, Djibouti, Russia and Saudi Arabia. This last, at a Freedom House event last week, was said to receive UN / UNDP electoral assistance for an election that excluded women. There are other UN silences that we will cover. Watch this space. Update of 11:11 a.m. -- the vote was taken, and a 45 minute adjournment was announced. In the upper deck, Susan Rice was in the US seat. It wasn't clear if she would speak and take questions afterwards. Mexico's Claude Heller spoke with the Press for ten minutes, while he took congratulations in advance from other Ambassadors. A senior UN political adviser was unwilling, when asked, to commit himself to a prediction. He said there might be a sympathy vote for Djibouti due to their problems with Eritrea. Then again, Djibouti has both French and US bases.